July 21, 2017, ©. 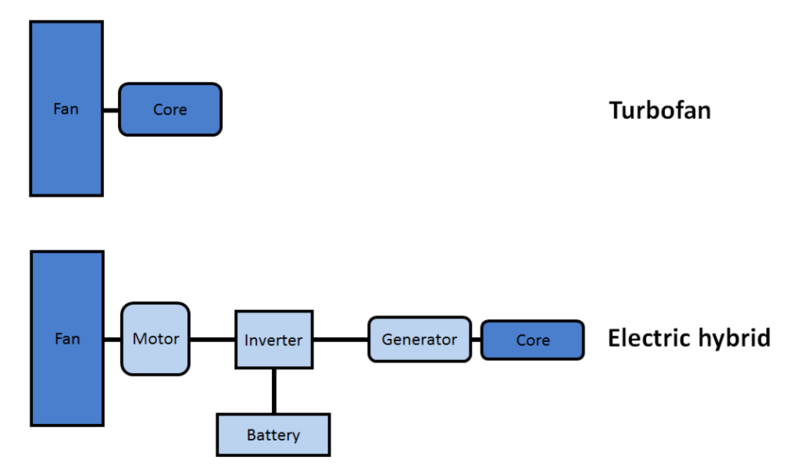 Leeham Co: In this Corner, we will start looking at the mass of the different components in a hybrid electric propulsion system compared with a classical turbofan propulsion. Our propulsion project is for a regional airliner with 50 seats. The segment marked the start of the regional airliner with Bombardier’s CRJ-200 and Embraer’s ERJ-145. Today, the segment is more and more flown with Turboprops like ATR42-500. Figure 1. Zunum aero regional airliners and a NASA boundary layer ingestion airliner. Source: Zunum aero. We will develop the different masses for the components in a hybrid propulsion chain and compare these to the mass of a normal turbofan propulsion system. The components are those in Figure 2. Figure 2. A turbofan compared with a hybrid propulsion chain. Source: Leeham Co.
We will assume the fan modules will have the same total mass irrespective if they are divided in two or four units for the aircraft. For a regional airliner of 50 seats, the fan modules on the aircraft’s turbofans weigh about 180kg each. A modern high-pressure turbofan core for this size airliner will have a mass of around 570kg. In total, the turbofan will have a mass of 750kg and the propulsion unit (turbofan with nacelle and pylon) 1,050kg. The propulsive power at takeoff is 40kN (9,000lbf) per engine. The shaft input to the fan, from the core, will be 7,000kW at takeoff and 3,000kW at cruise. To propel our airliner at the dimensioning take-off case, where one propulsion unit is inoperative, we need the same V2 safety speed power from three propulsion units as one of the turbofans, i.e. 7000kW. It means we need 2,333kW per motor driving the fans. Our take-off power is then 4*2333kW=9,332kW instead of 14,000kW for the turbofan case. Electric superconducting motors for driving fans will have a special build. Fan modules, whether for turbofans or electric propulsors, create large gyroscopic forces. Therefore, a motor with a bearing holding the fan is heavier than the equivalent generator. The specific mass for such motors is ~5kW/kg, whereas the generator is a bit higher at ~8kW/kg. The four 2,332kW motors would then have a mass of 467kg each. Add a fan unit mass of 90kg and then put it all in a nacelle and on a pylon. In total our propulsors (with nacelles, fans, motors and pylons) will have a mass of 700kg each. If we now put together our hybrid chain’s propulsor units, we have 4*700kg=2800kg. This is 33% more than our two turbofan propulsive units. We have still not counted the gasturbine core and its generator yet. Nor have we counted the battery or control electronics. We will add these units in our next Corner and see where we land. We will also discuss whether our hybrid architecture might bring us some gains in the sizing of the components. If you’ve got four independent propulsion units, surely you won’t need 14000kW of power at take-off? A twin engine vehicle does, because if one engine fails then the other has to do the job itself. In other words the vehicle has to have at least two times as much power as it will ever need. A four engine vehicle should have only 4/3 as much power as it will ever need. I calculate that the four engine vehicle will require only 9333kW at take-off, to cover a single failure. This changes the maths. I have changed the article too reflect that you only need half the turbofan power at V2, the safety speed, and that this is now shared between three of the four hybrid propulsion units. This was the reason for us to go to four propulsors in the first place. also cross connect at the intermediate DC buslevel. i.e. you can loose one generator or propulsor with less impact than loosing a complete engine. After you finish this series, can you write about open rotors/propfans? we will cross over to higher bypass (lower specific thrust) solutions (propfan/open rotor and propeller) as we will see that the electric propulsion is not really suited to step in at the speed range of a regional jet. Just follow the series.